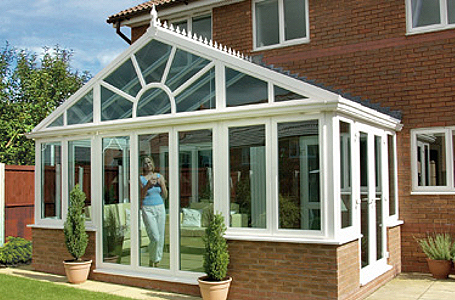 Few conservatories are more imposing or enjoy a great sense of presence than the Gable. A style that works especially well with older properties, these conservatories have a square floor plan. In addition, and unlike the Georgian/Edwardian or the Victorian, they also have a vertical rather than sloping front roof section, this maximises the feeling of light and space inside. The Gable front is a blank canvas for a huge number of designs to be built into the fascade.